Good morning! 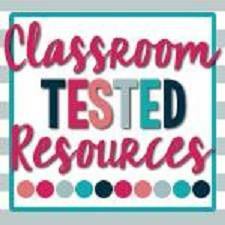 I wanted to share a post that I wrote over at Classroom Tested Resources, a collaborative blog that I'm part of! I was featured just yesterday with this post! In case you haven't read it there yet, I wanted to share it here too! PLEASE be sure to head over to the CTR blog though to see tons of awesome ideas that a collaboration of teachers share DAILY! There are a variety of topics and grade levels covered...and some GREAT ideas! I'm always looking for fun ways to teach (and review/practice!) nouns. 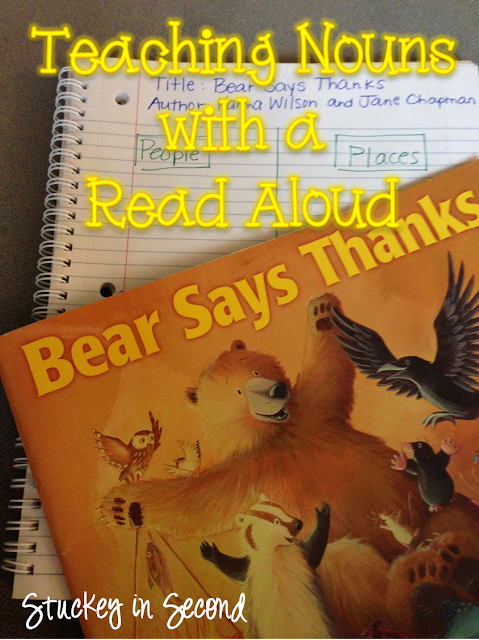 I'm going to share how to use a simple read aloud and have your students help you find nouns in the story by recording them in their reading notebooks. 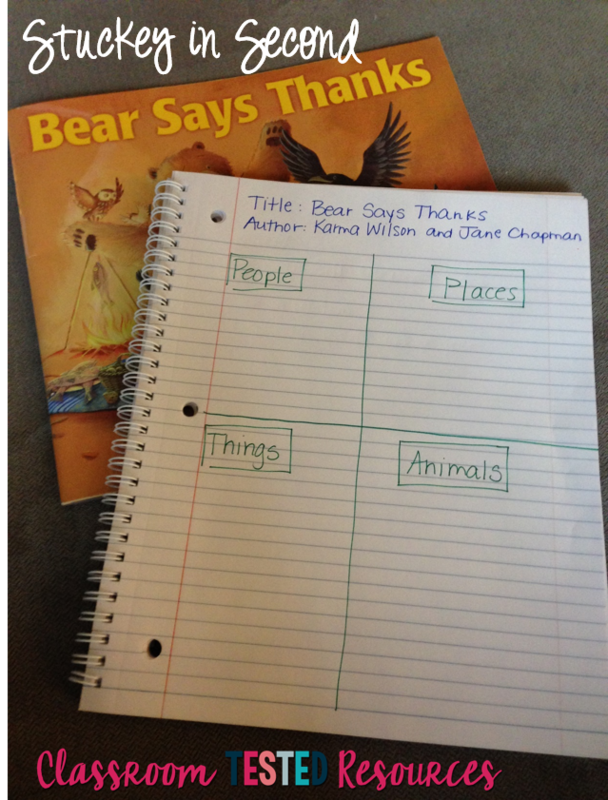 Also, you could easily modify this by you (the teacher) creating an anchor chart as more of a shared lesson. It would depend on the age of the kids. My second graders can be kind of in between when it comes to the ability on this. Sometimes it's just easier for me to do a shared anchor chart together, rather than wait for each kid to "keep up" with us in their own notebooks. In doing this, I would have my own notebook under the document camera and I'd be working right along with the kids, so it would still be a "shared/guided" lesson. 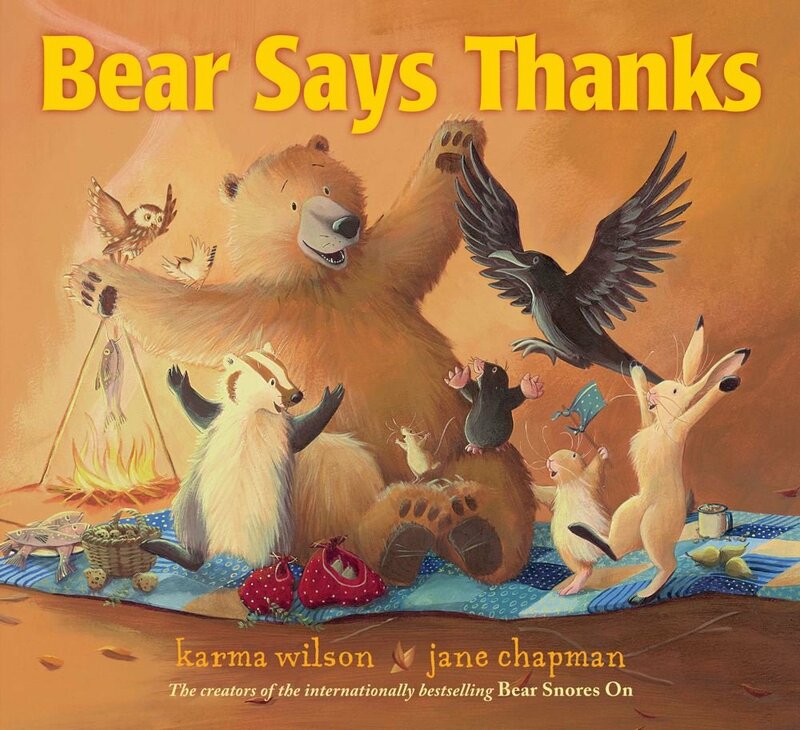 First of all, I love The Bear Books by Karma Wilson and Jane Chapman. My girls at home love them and my students love them. They are adorable and fun stories! (They are pretty quick reads, too!) For this lesson, I used "Bear Says Thanks". 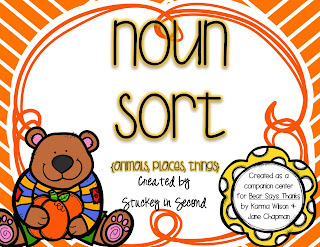 I started by doing a quick mini-lesson with my students about what nouns are: person, place, or thing. However, I did add in ANIMALS to my list, too. This can be kind of a questionable subject I have found, some teachers think you should just put animals under THINGS, which I agree with since they are THINGS. However, for this particular story, it worked well for me to actually add the extra category of ANIMALS because this book is all about animals and there aren't any PEOPLE included in this story. 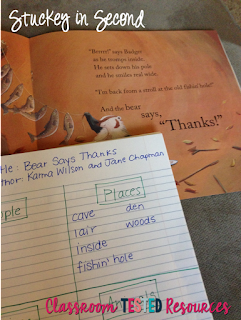 So, in this case, I had to show them that you won't always find something for all of the noun categories in a story because sometimes people or animals aren't included. I did keep the PEOPLE category on the simple chart we made though. We have done other activities where they have practiced finding PEOPLE as nouns, so I felt comfortable doing it this way. 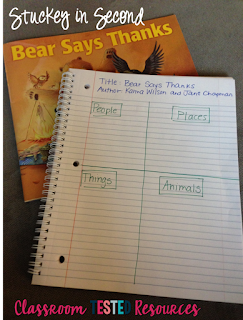 Next, I asked students to just verbally name some animals, places, and things that they remembered from the story. We are sitting on my carpet (where we always do read alouds) and they raise their hands and share with the class some nouns that they can recall from the story. They could name quite a few! After that, we head back to our desks and take out our reading notebooks. In my own reading notebook, I model how to draw a quick, simple chart (nothing fancy!!) and they copy it into their notebooks too. Then, we opened up the book (under the document camera) and I started rereading the story while the students followed along, and we searched for nouns. We stopped on each page and started filling them into our chart together. They helped me and I helped them. We all worked together and my students loved it! I found it to be a fun and easy way to "come up" with nouns instead of just trying to think of them on their own. Especially because authors of some of these awesome books use such GREAT vocabulary in their writing that students would most likely not think of on their own. As a matter of fact, I wouldn't think of them either!! Obviously, this idea could be used with ANY book that you choose at any time of the year! I also think this has helped my students with not only knowing what nouns are, but giving them some ideas for better vocabulary when it comes to their own writing! I've created a freebie to go along with this story as a special gift for reading my blog post today! You could easily put it into a workstation after teaching this lesson, just to reinforce the skill. Also, if you notice some students just not quite grasping the concept, this would be a fun and easy activity to do afterwards in a small reading group or one-on-one. If you really enjoy this book Bear Says Thanks, please visit my store for a full literature companion pack that contains multiple centers and activities to go along with the book. It's coming soon! Don't forget to check out the CTR blog for some awesome ideas from a great variety of bloggers! Click below to head over there now!